There are many different hamster toys you can choose from. Whether it is a tunnel, hamster-chew-toys or any other type of toys, you need to buy toys for your hamster. Hamsters are active little creatures that need to exercise every day. You cannot let them run around the house or take them for a walk, but you can provide them with different toys as well as an environment where their exercise needs are met. To remain healthy and happy, hamsters need stimulation, exercise, and fun, like any other pet. Different toys offer different forms of exercises for your hamsters. We have created a list of best hamster toys as well as an exhaustive buyer’s guide to help you buy the best toy. Remember to occasionally change the toys your hamster plays with to prevent monotony. What Are the Different types of Toys for Hamsters? These serve dual purposes; they offer a surface for your pet to gnaw on and also provide entertainment. Rodents and hamsters need to chew to make their teeth grow to the optimal size. Gnawing helps to keep their teeth filed down. You should buy a few chew toys for your hamster for this purpose. Your hamster will chew them while playing with them. You will find hamsters burying them in their bedding. These are a fun source of exercise. Buy your hamster a ball with holes, but make sure the holes are not big to avoid your hamster paws from getting stuck. Most hamsters don’t have good eyesight, and thus you may need to buy them colored balls. Place the ball in the cages for a limited time; this is to prevent them from getting bored. They can also get stressed because of excessive play. Tunnels act as great entertainment for hamsters. You will often find them playing for extended periods running through tubes. There are hamster cages that come with attachable and customizable tubes, but if yours doesn’t have tunnels, you need to invest in a couple of them. Purchase a couple of them for more fun. You can also use tunnels to connect to a second cage if you want your hamster to explore more. There are many different shapes and types of tunnels. Choose one that suits your hamster. These are fun hamster toys. There are different varieties of houses and climbers designed for hamsters. Climbing blocks and wood ladders offer hamster an extra height to explore. There are also wood ladders for hamsters. Some are made of hardwood materials while others are made of coconut shells. There are also hanging toys, bridges, and walkways made by organic ropes such as sisal, cotton, and hemp. You need to be cautious with hanging ropes and toys- they need to be thick to avoid tangling your hamster’s head or legs. If you are a happy owner of a hamster, you know that toys are a necessity for offering your small companion joyful and healthy lives. There are various and multiple gadgets and toys on the market that can satisfy your furry friend’s natural curiosity and prevent boredom. One of the significant characteristics of hamsters is that they have to chew. Therefore, not any toy can be a safe one for your hamster. You should not purchase items that contain toxic chemicals or finishes or those that get spoilt too easily. Another safety aspect to consider are the edges. Avoid toys with tiny parts and sharp edges as they can become a potential injury or choking hazards. When you want to buy a new toy for your furry friend, make sure to select one made from natural materials such as wood or coconut shells. Ensure to check out the specifications of a toy to ensure it is labeled pet-safe. As hamsters are of different types and sizes, so do their toys. When you want to purchase a toy for your hamster’s habitat, you need to keep comfort your pet will derive from it in mind. If your pet has a small body, the toy you choose should not have huge holes that they can fall through. On the contrary, if you have a hamster with a relatively larger body, make sure the toy is suitable for them because you don’t want your little friend to get their legs stuck in tiny holes. Also, you should not buy a toy that is too big or too small for your toy. The benefits a toy will deliver. As much as toys are meant to provide your hamster some entertainment, there are beneficial in different ways. They are beneficial to your hamster’s health in different ways. 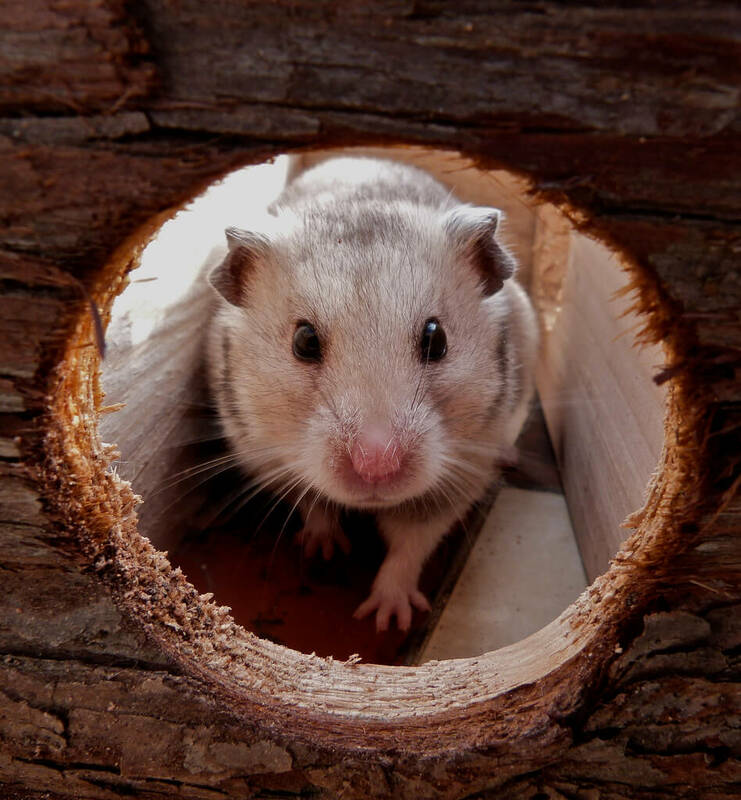 Because they are not living in their natural habitat, hamsters kept in their cage are not getting the usual exercises they would get while in the wilderness. When in the wilderness, they hunt their own food. This means traveling great distances. Thus, they never get unfit or get bored. It is therefore essential to offer different types of toys. Chew toys provide exercise for teeth, while ladders and climbing toys offer muscle exercises. Tunnels and balls sharpen your hamster’s mind. There are various types of hamster toys on the market designed for different purposes. Choose ones that are not only suitable for your hamster’s size, but also one that suits your pet’s activities. Ensure to buy different types of toys to satisfy your hamster’s natural instinct to burrow, hide, run, climb, and chew. When buying a hamster toy, it is essential to know that they are made from non-toxic, hamster-safe materials. Your hamsters will usually chew on virtually everything made from plastic, wood, or other soft material. Therefore it is best to buy a toy that is made of sturdy material. Buy a toy made from toxin-free or natural materials to prevent them from getting torn by hamster teeth as this can pose a danger to their health. Also, avoid toys made of synthetic materials that are designed to mimic the natural materials. Most of the synthetic materials are not safe for hamsters. Colors are another essential elements as well. They stimulate and make the toy more exciting and attractive. Almost all the products we have reviewed here are brightly colored. Wooden perches and hideaway are often dyed in natural colors to make them look like natural resting and hiding places of a hamster. Regarding extra features and accessories, there are many things that can be added to make toys more exciting. Such accessories include plastic balls, marbles, and small bells that are tied to moving bridges, swings, and mirrors. They provide excellent training for the hamster and stimulate their brain by creating strange sounds. Besides, this means you will be getting different types of toys in one package. Multifunctional items are also preferred by hamster owners because they can be used by more than one pet, meaning they will offer quality entertainment for several pets. Some toys will last longer than others. The amount of maintenance needed will also vary. For instance, if we talk of tunnels, cardboard tunnels will be durable but very challenging to clean. To solve this problem, go for a tunnel that has an open bottom; it will be easier to clean than a plastic one with a sealed bottom. The type of funnel you choose depends on the space you have and whether or not it will suit your hamster. Tunnels are made for different types of hamsters, and thus it is best to go for one that best suits your hamster. As previously mentioned, hamsters can get bored with toys quickly. If possible, have a couple of toys that you can rotate to keep your hamster interested. By rotating them in and out, you will have a happy hamster. One of the biggest things to steer clear of when shopping for a hamster toy is anything that is unsafe for your hamster. Avoid toys that your hamster can swallow whole. Also, avoid toys that can easily break down into small pieces that can be swallowed. Toys with sharp edges should also be avoided because they are an obvious danger. After buying a toy, run your hand along the edges to ensure the toy doesn’t have sharp points. If the tunnel is made out of softwood, be sure to expect splinters. To avoid this, either steer away from wooden toys or check for wear often. You need to do your research well before giving your hamster any toy. Some may come with treats that are not good for your hamster. Avoid toys that may have chemicals in them as they can be hazardous for your pet. Also, steer clear of toys with vanish on them. A tunnel with poor ventilation can be dangerous and thus should be avoided. Also, you should not go for tunnels that are too small to avoid your hamster from getting stuck. The best tunnels are those made of twigs and grass as they allow air to flow in and through them. Tunnels designed for sleeping should have enough ventilation. There are many safe tunnels on the market; therefore, if you are not sure of the safety of a particular toy, it is best to skip it. Some tunnels are made of a waterproof material. Therefore, if your hamster is not litter box trained, this could pause a challenge as they will urinate and defecate in the tunnels. This means you should go for a tunnel that is made out of a material that can soak urine and avoid a waterproof one if your hamster is not trained. When buying a toy for hamsters, make sure it is not made of toxic materials. As aforementioned, toys should be made of hamster-friendly materials. Always, check to ensure the materials are toxin-free. When you are buying online, ensure to read customer reviews from people who have bought the product to know past experiences. This is an exciting tunnel to add to your hamster’s cage to keep them entertained all the time. Besides, the wood is soft and safe to chew. The toy is a great way to enhance your hamster’s mental strength and offer physical exercise. The dwarf hamster favorite toys have a strong rope that will last long. This is a colorful addition to your pet’s habitat made of durable plastic. The igloo helps encourage natural nesting instincts in small animals. Besides, you get the hamster toys cheap. The bridge tops the list in terms of cuteness with a rainbow painted on the side. It is arch-shaped to offer a place to play and a tunnel to sleep underneath. Looking for a house where your small pet can hide and sleep? If your hamster doesn’t play with toys, try this one. The house offers a great hideout and promotes chewing and nesting. This is a favorite toy for most pets that come with multiple ladders. Your pet will enjoy resting on the hammock and climbing the rope ladder. If you need an entertainment center for your hamster mice, gerbil, and other small animals, here’s a perfect one for you. The house is large with safe to chew wood. This is a colorful addition that attaches to your cage easily for your hamster or mice to climb. The hamster toys and chews can be used by both Syrian and dwarf hamsters particularly the active ones. Most customers report that their small critters love to move up and down. The design is cute and large which makes it suitable for larger Syrian hamsters. When you see rosewood hamster toys, you can always expect quality. This one is easy to install in your hamster’s cage because you just need to suspend the toy from the roof of the cage and watch as your pet climbs and runs across the bridge. If you have some space in your hamster’s cage, here’s a hideout and chew toy that can also be used as a ramp to connect levels in the cage. Your little friend will enjoy playing over and under the toy. With its sturdiness, the Niteangel Small Animal toy is one of the best toys for ferrets and cats. This is one of the best hamster exercise toys that can easily stay put in the cage. If you have small animals that love to climb, this is a perfect choice for you that comes with metal screws to attach to the cage. The ladder acts as a great ramp, particularly for custom built cages. These are good looking wooden platforms for dwarf hamsters to play with. They are well built, and the bridge can be shaped. The wood is safe for rodents to chew. Most customers have praised this toy for keeping their pets busy in the cage. A great way to add fun to the hamster ball toys is to put a few treats so that they can push the ball here and there. It comes with five toys, so you can keeping your pets busy in the cage even they don’t like some toys. The wood is safe for hamsters to chew. A play toy or two are a great addition to any hamster’s life. They exercise they provide them worth the money spent on them. There is no one-toy-suits-all-hamster. Therefore, choose one that will make your hamster the happiest. Some hamsters like wide open tunnels to race through while others prefer tight tunnels so they can feel secure. Others like chew toys than balls and climbing toys. It may take some trial and error before you discover the toys that make your hamster happy. Read reviews and online forums to know which type of toys your type of hamster will like. In our reviews, we have indicated what each toy is best suited for. We hope that you will find the best toy for your hamster in our guide. All the toys we have reviewed here are safe for your hamster and are durable.